Like I mentioned on Sunday, I spent this past Saturday morning at the Wisteria Warehouse Sale. 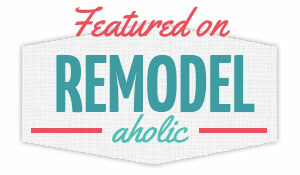 It was a dream come true for decorating nerds and shopaholics, and I fit into both categories. I get my decorating and shopping skills from my mom, who just so happened to be visiting this weekend, so I took my parents to the sale with me. Within 10 minutes of walking up to the sale, we had all separated and darted off in different directions. We were off to the races, searching for the ultimate Wisteria treasure! My dad doesn't so much like to look at the items as a decorator, but his goal at these events is to find the item that has the highest percentage discount– the best bargain in the building. I already told you on Sunday about the big ol' mirror that made it home with me. Scott was walking by it last night and said, "Man, that mirror is really cool." It's always a victory when my husband likes my big purchases, you know? 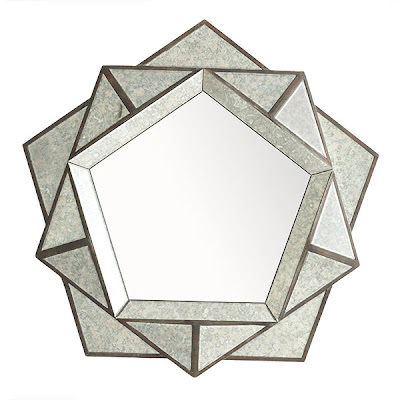 I paid $75 for my first purchase, Multiple Layers of Geometric Mirrors, which is retailing on the website for $379. My next purchase was this little guy. Yes, he's a boy. I just thought he was really cool and elegant. 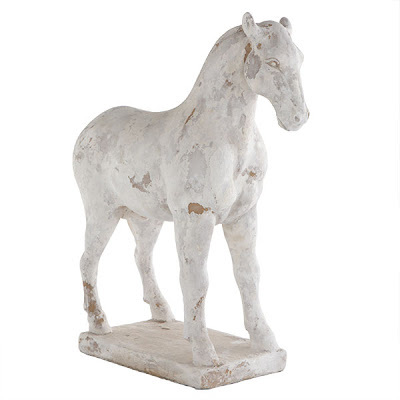 I thought of my mom when I first saw it because she a has a horse collection going on in her home, but we both ended up with one of these statues in our possession after the sale. The Chinese Zodiac Horse cost me $30 at the sale, and it was selling on the website for $169. When we put the statue on the table, the nuggets got all riled up. They were sniffing it and approaching it as if it were some rogue squirrel they were going to capture. Eventually they had enough and decided the statue wasn't a threat to their territory, but it was pretty amusing. Two hours later, we left the sale. I thought that was the end of it, but I was wrong! Somewhere around 3 p.m., I opened the giant mirror box because I wanted to show Scott my great purchase. (He was working, so he couldn't come shopping with us.) I pulled it out of the box, and he quickly pointed out that the glass on one of the side mirror was cracked. My heart sank. None of this stuff could be returned! I knew the sale was going on until 4 pm, so I convinced Scott to go back to the sale with me (only 10 minutes away) to see if they had any mirrors left that I could exchange with mine. Miracle of all miracles, they had one mirror left, and they were willing to let me exchange mine. PHEW! Cracked mirror crisis averted. My treasure-hunting husband was wandering around the warehouse while I negotiated my mirror exchange, and I finally found him again near the clothing chests. There was so much beautiful furniture for sale at the warehouse (at huge discounts!) but I didn't feel like our bank account could make a really big purchase like that. The one item I really loved was this map chest. 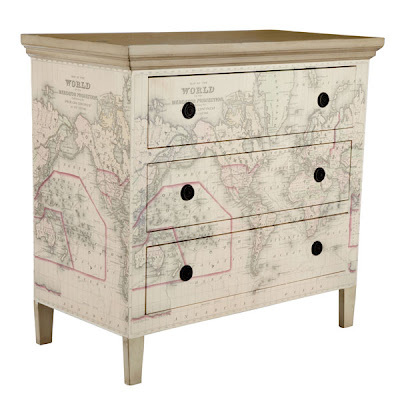 It lured me in with its sweet vintage map and neutral color scheme, but it was out of range at $250. That's not much for a dresser that was retailing for $1,000, but it was more than we were willing to spend. Scott loved the map chest too, and we were studying it closely as the Wisteria sales people waited around for the sale to end. You could tell they were ready to celebrate the end of that 3-day sale. There was one chest that was slightly damaged (a scuff on top and a small peel on the side) and only priced at $200, so we asked the Wisteria sales person if the price was negotiable. She said she could come down to $175. Me, with puppy dog eyes: "Does that take into account the damage?" Wisteria lady: "Did you see the original price?" Me, sheepish: "Yes, I was just... begging." Wisteria lady: "Well, I didn't see that peel in the corner. I'd be willing to come down to $150." At this point I was starting to get excited that we might be able to afford it, but Scott wasn't ready to spend the money yet. We were both sitting there, staring at it and wondering if we should buy it. Wisteria lady, clearly taking pity on us: "Are you two just starting out? I tell you what..."
She grabbed the price tag and wrote $100 in big letters. My eyes got wide. What a deal- $100 for a dresser that normally costs $1,000! We were both pretty excited. Who cares that we only got that deal because we looked like really pitiful newlyweds?! The lady was nice enough to tell us that they found a small map the size of copy paper in Europe, and they had it enlarged for this chest. She said the top of it was tea-stained, so we could use that technique to touch up that scuff on top. We found out the one we were buying was the original prototype, so it was actually slightly better quality than the ones that were mass-produced. COOL. She was really helpful! Right now we packed it into the guest room to give our lovely guest more storage, but who knows where it will end up after that? It would be so cute in a child's room down the line, but it's neutral color scheme lends itself well to almost any space. Ok, that's the story of the Wisteria Warehouse Sale. If you're in the Dallas/Fort Worth area and like to shop for really cool home stuff, get signed up for the Wisteria mailing list. That's how I found out about the sale. You can also like their Facebook page to get the latest details on special sales. I've been told they do them twice a year, so there will be more goodies to be had this spring! I can't wait! They also have an outlet here in Dallas by Love Field airport, and I've heard it has pretty good deals.